A.N.D. Sponsored Janitorial Training - A.N.D. Working in collaboration with our partners from SourceAmerica, DelARF sponsored a 3-day Janitorial Training event in New Castle April 7th through 9th. 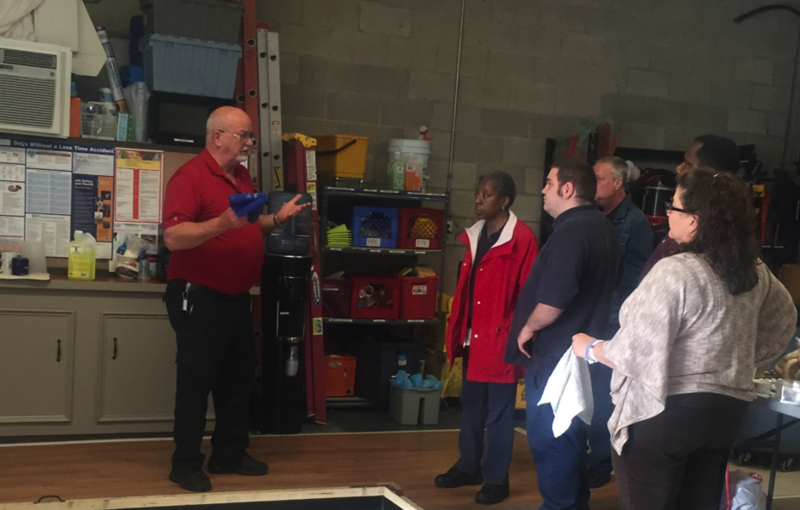 The training was designed to benefit the entry-level custodial employee as well as teach seasoned managers some of the best practices in the janitorial services arena. Source America’s Charles “Mickey” Crowe, one of the foremost experts in the industry, led the 3-day training and discussed a wide variety of subjects ranging from choosing the right chemicals to how to implement an effective quality assurance strategy. With over 30 employees from Easter Seals, ServiceSource, Goodwill, Connections, and Chimes participating, the training was considered a great success! Thanks to these organizations and their employees for committing the time and resources to attend this important event. DelARF would like to also acknowledge Brandt and Alvin Emory from APS Cleaning Services. APS was gracious enough to host the event at their training facility and allow us use of their machines, space, and materials.